Terik lays the body of his fallen comrade before the high priest. "You seek the divine aid of my goddess, adventurers," he asks as he peers into the smoking brazier. "The goddess shall grant you aid. But first there is a task you must perform." 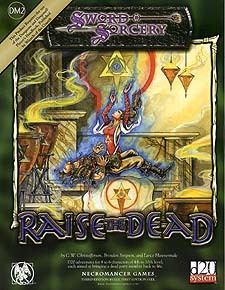 Raise the Dead turns death into a chance for adventure! Occasionally, a player character dies. This DM Utility product contains four thrilling quests designed to bring a fallen hero back to life. It includes options for non-good aligned characters and other "difficult to raise" characters such as druids, rangers and non-humans. This book also allows interesting options for the player of the deceased character.